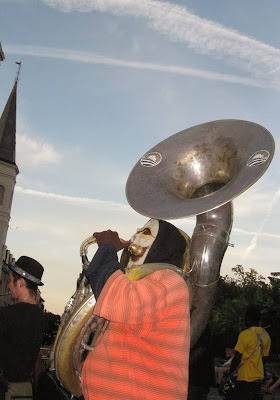 A few days before Halloween, Husband Walter and I arrived in New Orleans for a two-night getaway. 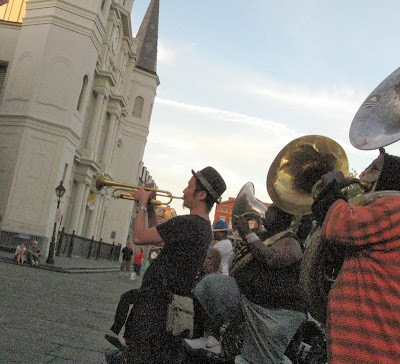 We saw the street musicians below during an after-dinner walk around Jackson Square. One of them was already in the Halloween spirit. When I switched to using my camera’s flash, he realized I was focusing on him. He obligingly faced me and kept on playing. Ghost tours, including famous haunted houses and cemeteries, are offered all year in this city of history and mystery. 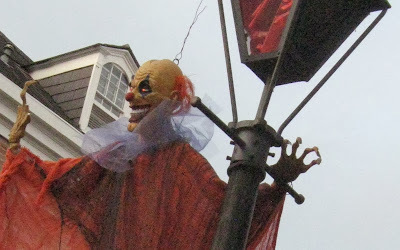 Hubby and I had done self-guided walking tours before, but for this NOLA visit we planned to take a guided history tour the day before Halloween and one of the ghostly walking tours later that night. After more than two hours on the walking tour of French Quarter history yesterday morning, we had lunch then collapsed in our hotel room for several hours. Abandoning our overly ambitious plan for the ghost walk was a mutual decision. 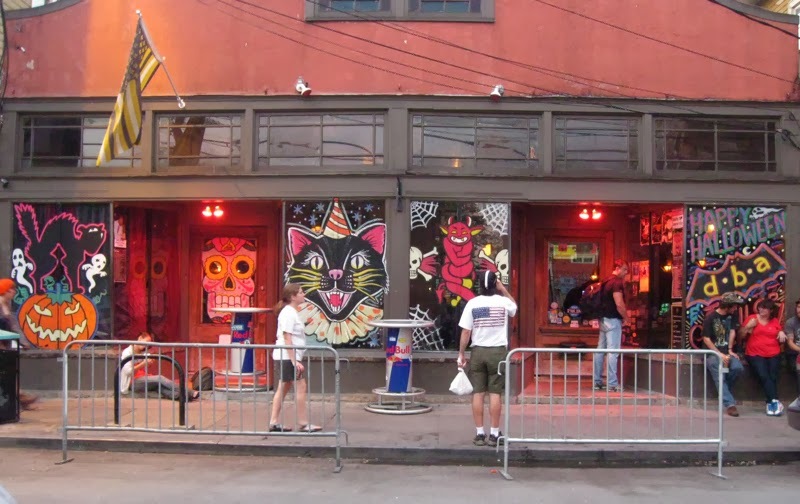 Instead we took a leisurely walk through the Faubourg Marigny neighborhood just adjacent to the French Quarter. We were a bit early for all the music club action that draws New Orleans and out-of-town music enthusiasts to Frenchmen Street. As we headed back toward the French Quarter and our hotel, we threaded and bumped our way through oncoming musicians with their instruments. They were on their way to set up for scheduled gigs in the clubs. It was enjoyable being a part of that energetic and vibrant milieu. It was also challenging and exhausting. Walking is fun and great for my stroke recovery, but so is adequate rest. I was thankful we were close to our hotel instead of on a second two-hour walking tour. 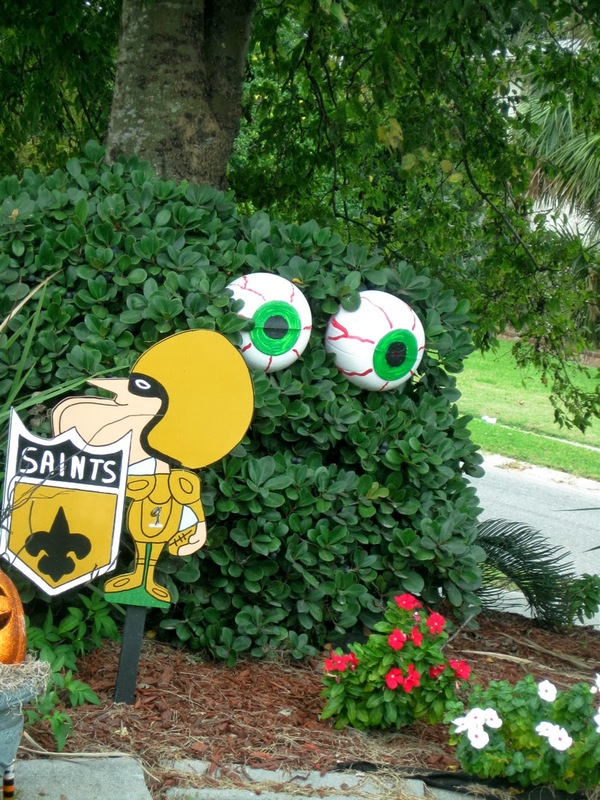 A Louisiana community keeps eyes on U.S. 90 Halloween travelers. Halloween 2013 has given me a happy supply of fun. 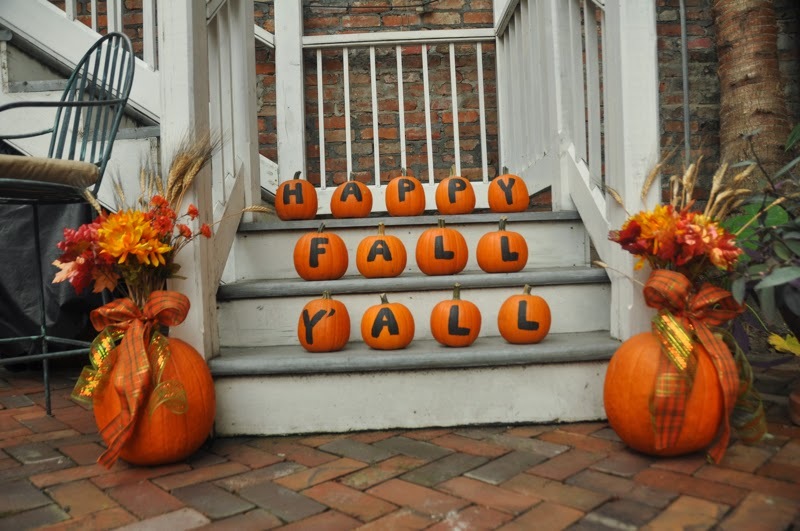 Hope your Halloween has been happy and fun, too! 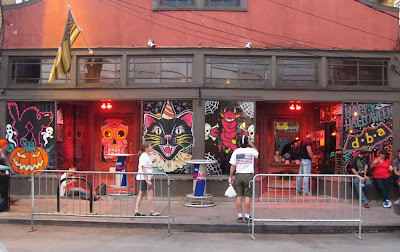 I love the mural with the big pink eared cat. He is a rel cool cat. And these people give street musicians a new meaning! Usually it is a lone guy with a guitar. I'm so happy you could have a get away. It always charges the batteries. You were wise to curtail the walk. You still got to see so much and had the fabulous photo ops. Our Halloween was fairly uneventful. Paid the property tax (ugh!) went to dinner at The Spaghetti Factory, (2 for 1 coupon) and gave out candy to 34 kiddos. They were such nice little ones. One even called my Hubby Papa when thanking him for the candy. His Mom said that any one that looks like a Grandpa gets called Papa. To cute! 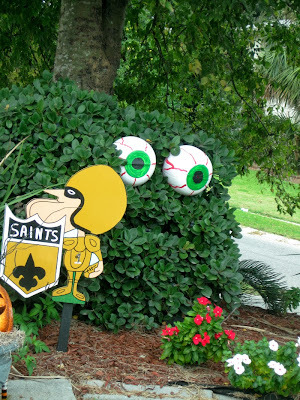 I hadn't thought about it but of course New Orleans would do Halloween up proud. 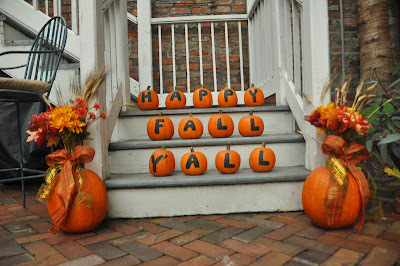 Love the pumpkin steps. That clown however gave me the willies. You make New Orleans seem like such a fun destination. Thanks for the virtual tour! You’ve been out walking? Splendid progress. A change is as good as a rest, they say. I hope you had a lovely trip. Oh how fun. 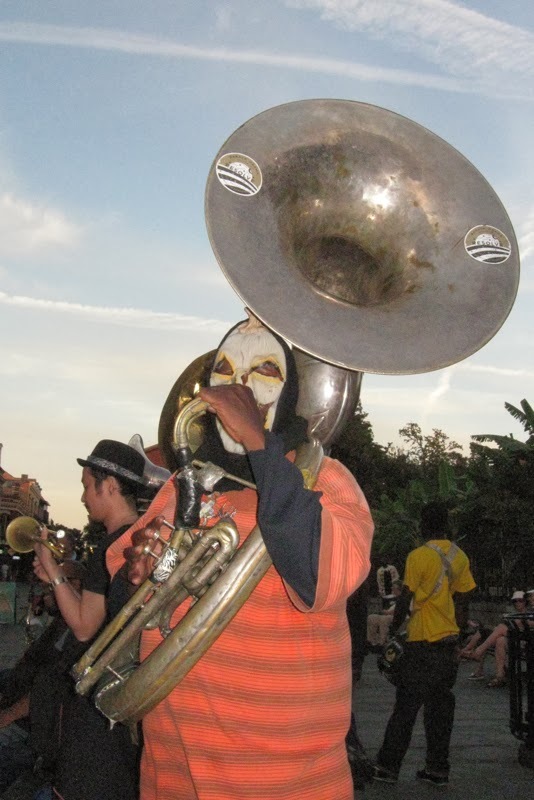 I've never been to New Orleans. I really want to make the trip someday in the future.